With this, his fourth waterfall guidebook, Albany writer Russell Dunn has now written more books about waterfalls than any other author in the world. 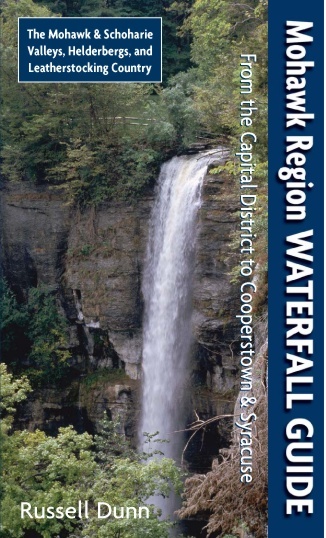 Mohawk Region Waterfall Guide treats the reader to 79 cool cascades, from the Helderbergs escarpment on the outskirts of Albany and magnificent Cohoes Falls near the confluence of the Mohawk and Hudson rivers, through the storied Mohawk Valley out to Utica, past the farmlands and historic villages of Schoharie Valley (the breadbasket of the American Revolution), out to Cooperstown and the legendary Leatherstocking Region, and along scenic Route 20 all the way to Syracuse. Dunn’s thorough research provides a wealth of historical and anecdotal material, and his detailed directions and maps make locating the falls easy. Illustrated with 70 antique postcards and 20 maps.